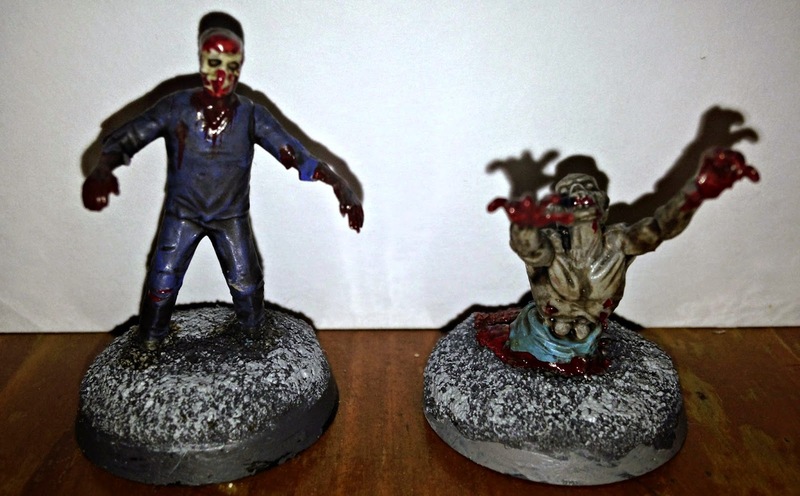 BZA Bob's Zombie Apocalypse in 28mm: VERY SLOWLY BUT SURELY. Motivation is lacking at the moment people, what to do, what to do. Well, I have managed a tiny bit of painting, let's get on. As has become regular, I first would like to present some more zombie art. BACK IN THE SHED ED. Yes, it's another fine piece by GRIMBRO. I'm sure all of you will recognise Ed (played by Nick Frost), Shaun's best mate from Shaun of the Dead(2004, directed by Edgar Wright). Wow, ten years already, that's just flown by. Another job before we get on. It's been brought to my attention that this whimsy of a blog has amassed more than eleven thousand page views. I'm completely flabbergasted by this response and would like to thank you all for taking the time to drop by and check in on the drivel I put out every week. THANKS EVERYONE. As I mention my motivation seems to be at a low point, so I've really been dragging my arse, painting these two was like pulling teeth. Still now the Autumn Internationals have finished I might get some time on a weekend to paint. So to the introductions, first we have another guy in scrubs an ODP (Operating Department Practitioner) going by the name of Gwern. Next is someone who was probably a patient of Gwern, he's known as Morddwyd. Ferrying my official photographer back and for to his placement in Swansea is also taking up a fair chunk of hobby time. For the time being he's sacked and my second official photographer is filling in, at least she crops and enhances her work before uploading it to my blog. Which I think is a vast improvement. 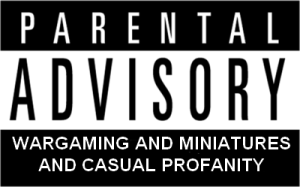 Sorry dudes and dudettes but that's all I've got for this week. 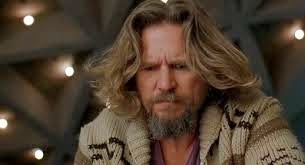 So until next time try and do as the DUDE does and "take it easy". I'm seriously struggling for mojo at the moment. Thanks for the encouragement. Just keep chipping away at things. Be ready when the mojo returns - you'll be able to capitalize on it! Love the 'shorty' zed. Those are some of the most frightening zombies to me - the torso, dragging along with its arms... Hiding under beds and in other creepy places. Makes me shudder. Yeah, "draggers" or "crawlers" are one of the most disturbing zombie types, in movies nobody ever sees them coming. Thanks for the mojo busting advice. Those are two mighty fine zombies, Bob. Losing your mojo is something that can happen to any one of us - me included! Just keep plodding on as you're doing and know it WILL return. You have plenty of followers willing you on and believe me, they are worth their weight in gold. That's some lovely praise and greatly appreciated encouragement. Like the DUDE, I will abide. Your right about the followers too, Dude. 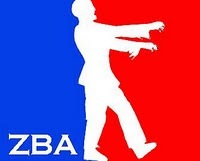 Legless zeds are so fun. I'm feeling the same old boy but we need to buck up and ride it out. You will get twice that many views next year make a not of it. 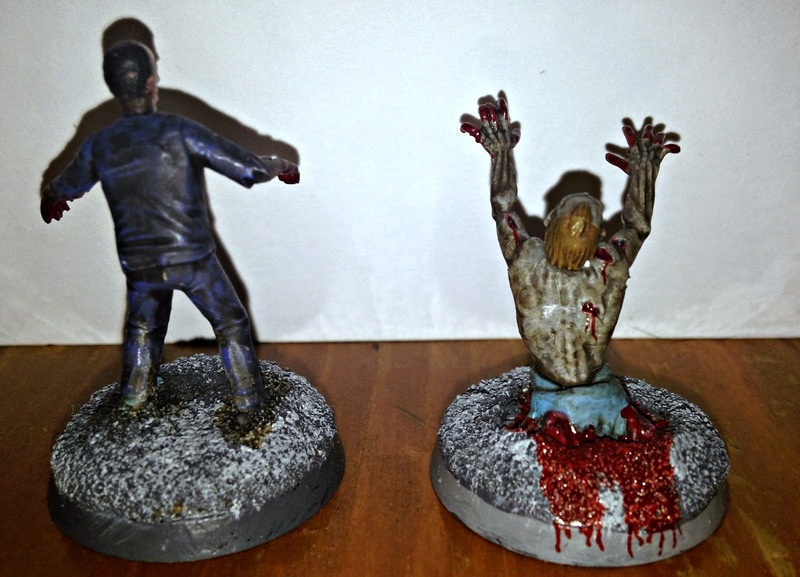 Legless zombies are great fun, scarily cunning too. They always seem to sneak up on people in movies. I'm sure my fugue will pass, it's just irritating whilst one is in the middle of it. Glad you like him dude! Oh, how sweet ... that little zeds reaching out, wanting his mummy. Head thrown back like a child looking up and silently begging for her to carry him. It almost enough to bring a tear to the eye. Not the sort of baby you'd want to pick up though. He might want to give you a little love bite. That would bring a tear to the eye. 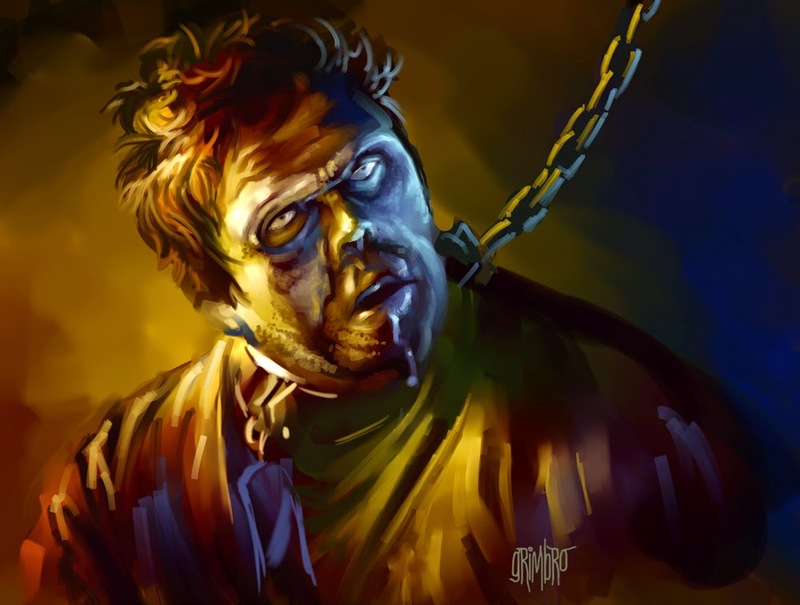 Whilst I never recognise any of Grimbo's creations, they are amongst some of the best Zombie art I've seen. I wouldn't worry too much about your loss of motivation, it happens and tends to come back with a vengeance. Glad you like the "art". GRIMBRO is very talented. Yes, I seem to exist on a motivational rollercoaster. Motivation comes and goes, don't worry about it too much. Maybe a new project is in order? But great job on the zombies. Never enough zombies. Nice work Bob, I love the blood running off the back of the base, was that deliberate or did it just run that way? The Mojo will return, I went 18 months without painting a thing several years ago, so I know just how you feel. 18 months, thats incredible. Makes a week or two seem nothing. He's a favourite of mine too. I think she might need a hosepipe! Don't worry about the motivation Bob, we all get there. I'm stuck in a place where I got tonnes of ideas and a wish to do something, but just can't sit down and do it. Well done getting a new photographer, looks like a determined one! I'm sure it will pass. Never mind it's Xmas soon. My new photographer is much more eager to help her dad. You have excellent taste dude.